Aquamarine is a gemstone that carries a reputation for its beauty. Named for its colour (the term “aquamarine” is Latin for sea water) its literal aqua-marine shade of blue or green has earned it a place of esteem in the gemstone world. In fact, aquamarine comes from a family background of some exalted gems and enjoys not only a place of respect because of its beauty, but also because of its impressive metaphysical properties. To understand aquamarine one must first understand Beryl, the mineral family to which aquamarine belongs. Beryl is a beryllium-aluminium-silicate, generally formed deep underground where beryllium-bearing gases react with aluminium and silica. It is usually found embedded in coarse granite known as pegmatite. Pure beryl is actually colourless, however, on account of its crystalline structure, it is able to store traces of other minerals within it. It is these foreign minerals that give rise to the various colour forms of beryl. 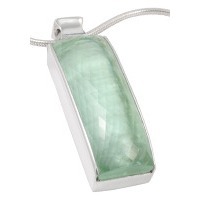 Pure, colourless beryl is known as goshenite. When beryl is invaded by impurities of chrome or vanadium the end result is an intense, green coloured gem, famously known as emerald. When it is manganese that occupies beryl crystals the outcome is either called morganite, if the colour is a soft and delicate pink gem, or bixbite, if the colour is an intense red. Traces of iron and uranium produce heliodor, a golden yellow-green beryl. Finally, it is traces of iron (Fe) in different concentrations and stored in different parts of beryl’s crystalline structure, which results in the shades of blue and green quintessential to aquamarine. Without getting too technical, when iron Fe3+ replaces the aluminium component in the ‘octahedral site’ of the crystal, a yellow colour is produced. When iron Fe2+ is present in the ‘interstitial channel’, a pure blue colour results. When both are present, a blue-green mix results. It is possible to heat aquamarine in the lab to remove the green hues from the stone, leaving a more intense blue. This process is reversible through irradiation. Both these techniques are considered as acceptable by the gem and jewellery industry. Aquamarine is credited with metaphysical properties that are beneficial both for worldly life and for those who are committed to higher spiritual pursuits. Aquamarine is a mover and a moderator. It encourages us to foray into unchartered territory and prepares the infrastructure we need to cope. Historically it was used by sailors as a charm for protection while at sea. It was referred to as the treasure of the mermaids and would be immersed in water to strengthen its power. It has also been worn into battle as a protection against injury and is said to provide a shield for ones aura. It is considered as a stone of Courage. 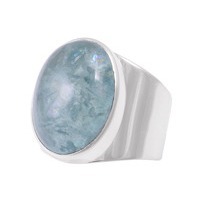 Aquamarine is said to be very beneficial for married couples. It helps husband and wife to work out their differences and to maintain harmony, integrity and happiness in a long and fulfilling marriage. It is also suggested that similar benefits in business relationships can be enjoyed. 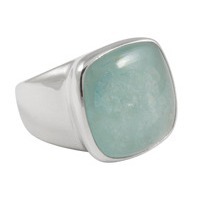 The energy of aquamarine is one of gentle force and form combined. It is a dynamic energy yet structured, bringing order and balance to projects that may otherwise be overwhelming. It is a great friend in learning, fortifying the intellect, accelerating intellectual reasoning and strengthening one through knowledge, as it enables one to delve deep into a subject and work through all the related complex issues while keeping them ordered, facilitating easier interpretation. For the spiritual seeker it supports the journey inward, providing the emotional and intellectual stability required to peel away the layers of emotional baggage, prejudices and value judgements that keep us from our higher selves. 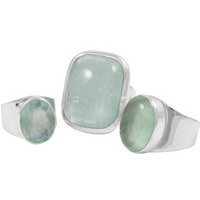 Aquamarine, which helps us to be so thorough in our search for knowledge, makes us accountable and impeccable. The lessons we learn about our environment and ourselves cultivate both foresight and insight, making us prepared for anything. But its energy is a gentle one, promoting tolerance and compassion toward others and inspiring us to perfect our world. 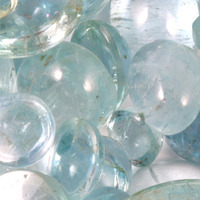 Aquamarine activates and cleanses the throat chakra, facilitating communication of a higher quality. It has been used as a treatment for swollen glands, to improve eyesight, and maintain healthy teeth and bones. It has also been credited with curing hiccups and insomnia. Aquamarine is the anniversary gemstone for the 19th year of marriage.